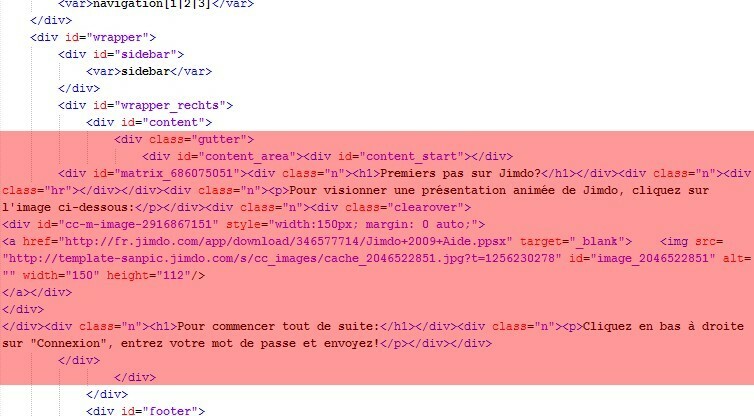 This article explain how to change the CSS of the default designs (available on the Jimdo menu). This tutorial is normally well explained, but it is still require to have few knowledge and understanding on xHTML and CSS, otherwise it may be too difficult to understand everything. Information: This tutorial is not 100% finished but nearly all the main steps are described. 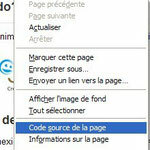 Moreover, this is a traduction of a French tutorial it is not necessarily a good traduction. Thank you for your understanding. The author of this tutorial does not give personnal support. 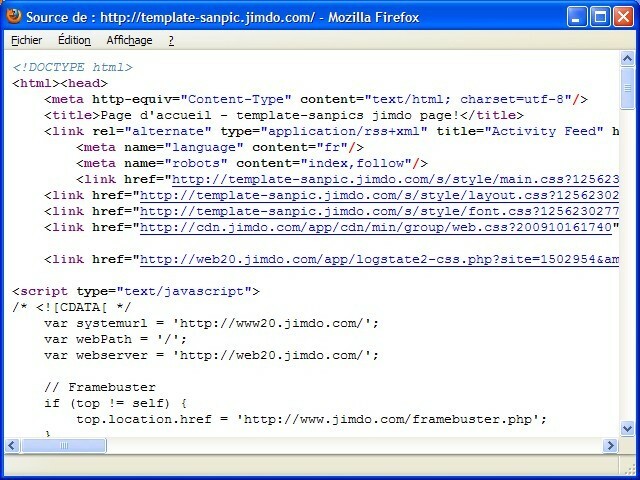 It has the purpose to help the Jimdo user that want to try to personnalise their website. 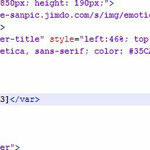 For more information or to understand everything, it is necessary to know the HTML and CSS. Many websites gives free information about that on the internet. Warning: Please, don't steal the design of others websites. Moreover, if you only have JimdoFree, you are not allowed to "steal" the designs available with JimdoPro and JimdoBusiness. The first step of this tutorial consists to create two text files. They will respectively contains the xHTML code and the CSS code of the design by default. To do that, create file with a really simple notepad. For example, you can use the default notepad on Windows. Create a file called "template1.html" (it will contains the xHTML code) and a file called "template1.css" (it will contains the CSS code). Information: If you want that your code has colours to see and understand easily the code, I suggest you to download Notepad++ editor.This software is easy to use, free and it is helpfull to understand the code. Make your choice and be sure to save it. You may need to log out and check if your website has the right design you want to edit. Information: Now you have chosen your design, but it is still necessary to choose a web page. I recommand you to choose a page with few content. It will be easier and lighter to edit on the source code. I also suggest you to create word that does not exist. For example, you cant create only one title that contain the word "rochimamo" (does not means anything). When you will see this word on the source code, you will reconnize where you are. Open your website with your favorite browser. Be sure you are log off. The idea consist to view the xHTML code of the page. 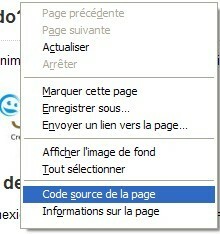 With Firefox you can do a right click somewhere on the web page and select "Source code of the page". A new window opened with all the source code. The next step consists to select all the code. The easiest way with your keyboard is to click on "ctrl+A" (select all) and "ctrl+c" (copy). 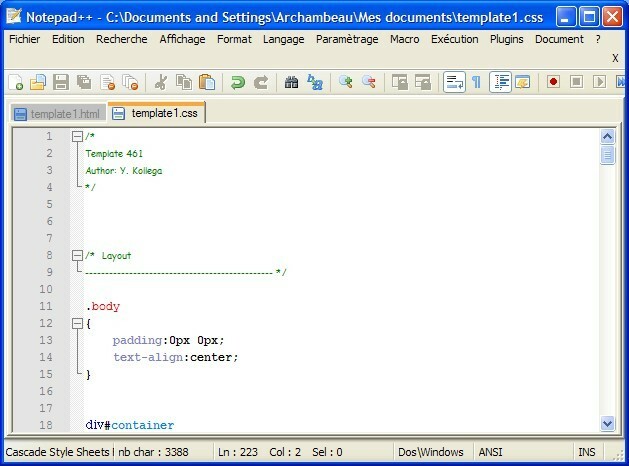 Now open "template1.html" with notepad (or best: Notepad++). Then you can paste the code using "edit > paste" (or ctrl+v). 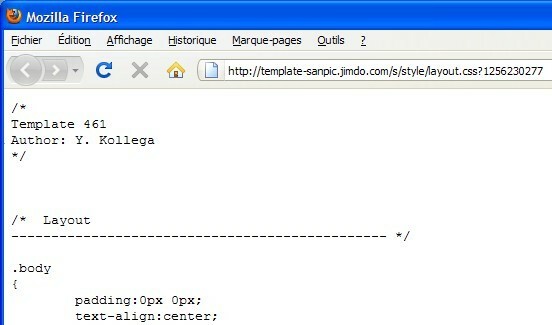 You can save your modification of the template1.html file. The following screenshots illustrated these steps. This file contains the xHTML that has been gather. Do not worry if it's not the same, every design have different source code. 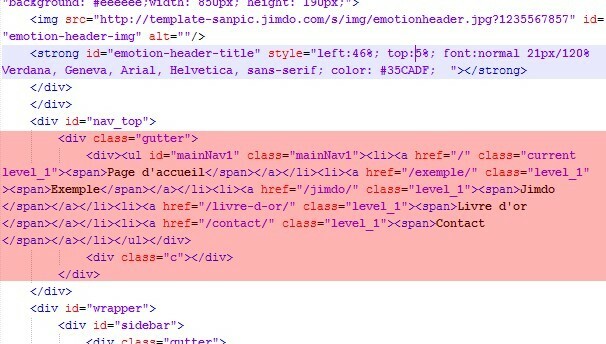 The code above in red is the URL to access the CSS file. 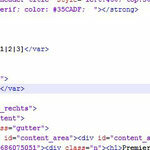 Please, be sure to have the layout.css file (and not "web.css" or "design.css" ...). Open this web adress in a browser to see the CSS source code. 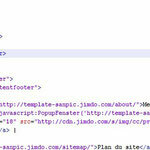 Then you only need to copy/paste the source code and to save it in a file that may be called template1.css. If you have follow the previous steps, you normally have two files that contain the codes: template1.html and template1.css. The next chapters start to be difficult because it is necessary to adapt these codes for the Jimdo format. 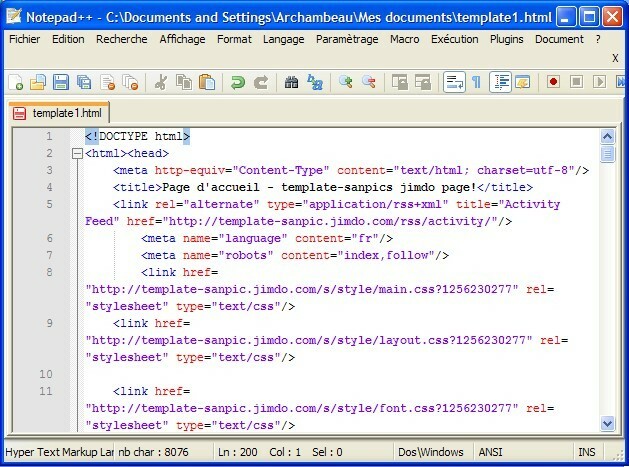 To start progressively, this chapter explain how to epurate the HTML code that you have in the template1.html file. Warning: To avoid a huge mistake, I suggest you to save your current files in another directory. In this way, you can restore them if you have made a mistake. In our case, it is necessary to keep the content that is between <body> and </body> (that <obdy> tags must be deleted too). Tips: On mostly all text editor on Windows, it is possible to search for a particular word on the content. The command to search a word is generally "ctrl+F" (or "edit" -> "search"). This is easier to search for example only the <script> tags or <body> tags (e.g. try to search the word "body" or "script"). Code to delete (included the lines just above and below this comment). There is still another way to epurate the code. It should be organized a bit. For example it is possible to delete the lines that do not contain anything. 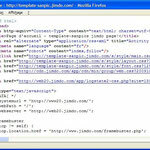 This file is similar to template1.html but with the modification presented above. As you may have understand, the following task of this tutorial consist to find the HTML code that is equivalent of the menu and to replace it by the "navigation" tags presented above (cf. <var>navigation[1|2|3]</var>). Obviously, if you know HTML it will not be very difficult. In the opposite way, you should be brave and patient if you don't know the HTML to succeed the following step of the tutorial. Before to start it is recommended to save the page template1.html. 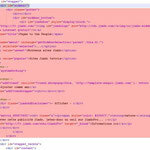 This code has replace the HTML navigation content by the equivalent Jimdo's tags (<var>navigation[1|2|3]</var>). Now it's time to adapt the code for the sidebar. Once again it will be require to find the find the code that is include in the sidebar and try to delete it with the same method explained previously. Knowing that the source code on the sidebar is much more bigger that previously, I recommand you to delete at first the small lines. Progressively you can delete parts of the code, when you start to understand how the HTML works. In my case, for the example that I'm doing for this tutorial, I need to delete everything that is situated between <div id="sidebar"> tag and a </div> tag located several lines below the first tag. Then it is only require to replace the deleted lines by this code: <var>sidebar</var>. After having realized the task described in this paragraphs, you may have a file similar to this one. If the previous two sections, you should start to understand what I will ask you here. You need to do the same thing for the "content" element. You need to find the main content (generally on the middle of the web page) and replace it by <var>content</var>. Once again, this is the code obtained after having followed this part of the tutorial. You may have not the same thing depending on the template you have choosen in your case. This (long) section of the tutorial is nearly finished. After having done the same thing for the footer, the worst part will be behind you. So find and replace the footer element by: <var>footer</var>. 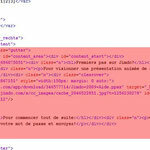 This code have the modification that replace the footer by <var>footer</var>. 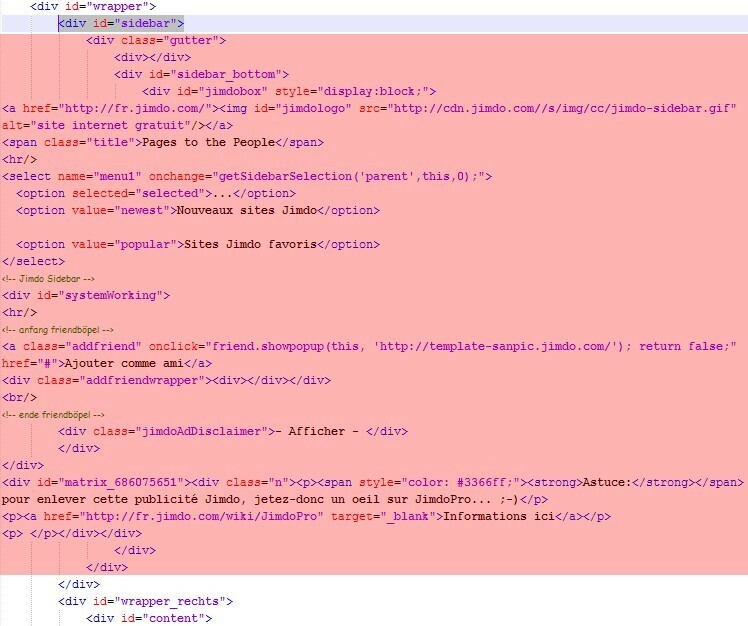 Warning: If you HTML code do not include the 4 elements (<var>navigation[1|2|3]</var>, <var>sidebar</var> ...), then you will not be able to do the further steps explained in this tutorial, because Jimdo's system do not allow a template that don't have these elements. The xHTML code is nearly ready to be implemented. There is only one element at the end of the file that should be deleted. Normaly, if you have used a Jimdo's template, one of the last lines of the code represent a kind of invisible picture that is used to gather statistics information (a counter is incremented each time the picture is displayed). Here is the code that will be used for the template. This step is a final one. You will discover your design if you done everything perfectly. 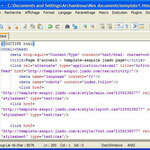 Try to be familiar with the menu that is divided into 4 sub-sections: HTML, CSS, Files and Help. First, go on the section "HTML", then delete the current code on this frame and replace it by the code on your "template.html" file. Take care to not save for the moment. Go on the CSS sub-section, delete the current code and replace it by the code that you have on your "template1.css" file. On the bottom of the form, there is a button called "Save", click on it. After the click, you will see an overview of the new template. If everything goes well, there shouldn't have any problem. 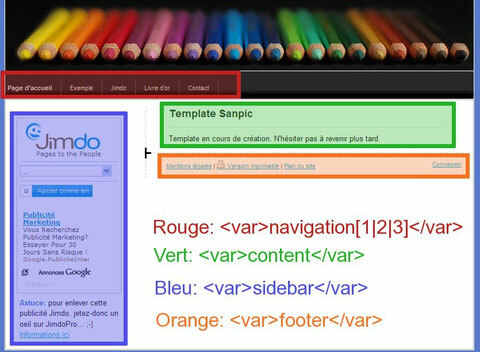 Don't forgot that the template will be exactly similar exept that you will be able to modify aftwards the HTML and CSS code (this is the advantage of having a personal template compared to a "normal" template provided by Jimdo). Information: If the design use some pictures, it is probable that these images are not visible with these modification. Effectively, the URL of the picture are probably different and should be modify on the HTML source code and/or on the CSS source code. The next chapter explain how to solve this problem. 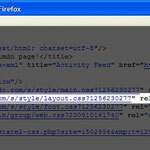 Once the design is implemented, you have the possibility to modify easily the CSS. In other words, you can modify the color/height/width/... of various elements. Unfortunately, everybody is not a web designer. For that reason, I recommand to newbies to search on Google the terms used on the CSS file. For example, if you want to understand what means "padding:12px", you may search with the keywords "css padding". 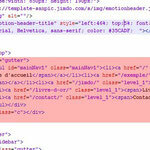 Information: Don't forget to use the word "CSS" on Google to be sure the results are pertinents. You may also directly have a look on a great website that I recommande: W3Cschool CSS tutorial. It explains nearly everything you should want to know about the CSS.